Extended maternity is an absolute luxury. In some cultures, mothers traditionally stay close to home for an extended period after their baby's birth. In Sweden, new parents are eligible for 480 days of leave that includes 18 consecutive weeks of postpartum leave at 80 percent of their salary! The rest of their days are theirs to use as they see fit. The United States offers new mothers 12 weeks maternity leave and it is entirely unpaid. Only certain employers offer paid maternity leave and it usually comes with stipulations. Statistically, mothers that don't receive compensated maternity leave are more susceptible to postpartum depression and anxiety. Without the luxury of extended maternity leave, paid or unpaid, mothers definitely need an extra set of hands. This is where your postpartum doula saves the day. There are a lot of misconceptions surrounding the doula profession and many families don't even know what we can offer families that are expecting a new baby. Postpartum doulas are by your side to nurture you and your entire family as you make the transition home with your newborn and begin the healing process. Different from a midwife's role, we are in the home paying close attention to make sure the mother is right on track with her postpartum recovery and keep everything running smoothly around the house and with the rest of your family. The first six weeks are the most challenging and your doula team is there to cut back on the stress of acclimating to your new baby responsibilities. We're on your schedule and customize our care plans to suit your specific needs. We work with the way you parent to encourage parents to learn baby basics and gain confidence in those precious first weeks. Since we offer overnight care, sleepless nights for new moms are things of the past. Sleep is incredibly important for postpartum mothers as they regain their strength, begin a breastfeeding routine and heal from birth. We'll take over newborn care in the evening to encourage mothers to get a peaceful and restful night's sleep they can count on. Getting your little one on feeding and sleeping schedules can be difficult with the "back to work deadline" looming overhead. Your postpartum doula comes with a little extra peace of mind that you'll be on a healthy schedule for pumping, feedings and naptime no matter how soon you expect to return to work. Your maternity leave may be short but it doesn't have to be stressful. A good support system is crucial for any mother bringing home a new baby and your postpartum doula is there to give you the help you need every step of the way. After all, teamwork makes the dream work. 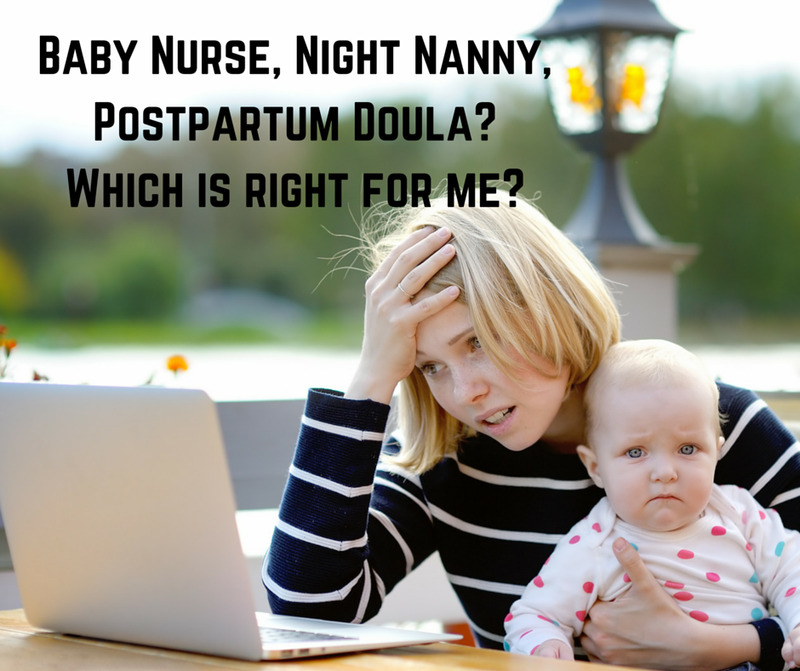 Baby Nurse, Night Nanny, Postpartum Doula? Which is right for me? This child did not come with an instruction manual! How can you ensure that you're choosing the best care for your family? The last one just brings up terrible hotel reviews, and the other descriptions don't sound like quite what you're looking for. You discover that most baby nurses are not actually nurses, and they are responsible mostly for watching the baby. You don't need a babysitter. You may need help with your baby, but you need a boost of confidence and a healthy dose of sleep. Finally, you remember something your best friend told you about her postpartum experience. She hired a postpartum doula. But wasn't that just for mother's with postpartum depression? Still, your friend has never steered you wrong, so you type it in. Finally! This is the help you've been looking for! You've been looking for your village and she's arrived in the form of your postpartum doula. Your doula is trained to ask the right questions to ensure that you are cared for in mind and body. You can enjoy a delicious amount of sleep when you're assured your baby is in the best hands. Your doula is fully supportive of your style of parenting; so you can get full breastfeeding support through the night or have your doula bottlefeed while you snooze. You can also rest easy through the day knowing; that small household tasks you would normally handle are being given attention, that your doula knows the most innovative baby gear to make life more smooth, that your choices for parenting will be embraced and encouraged. Sure, you can see that your doula will hold your baby while you shower just like a baby nurse would. But when you're in fresh clothes, she will show you how to put your new pump together, help you swaddle your beautiful baby and tuck you both into your beds, so she can run to the grocery store for you. You deserve to be cared for, in this most precious time. Now put the computer to the side and rest easy. Sweet dreams! So, you're here because you've been thinking about a doula for birth or early parenting. Maybe you've talked to friends or your OB, done a Google search, clicked through Doula Match, and right about now you're wondering: What's the difference? You've always known you were unique. And we know it too. Every family design is different and has individual needs. Whether you're currently a family of two or ten, whether you've come to parenthood through chance, trying or trial; we understand your dynamic life. 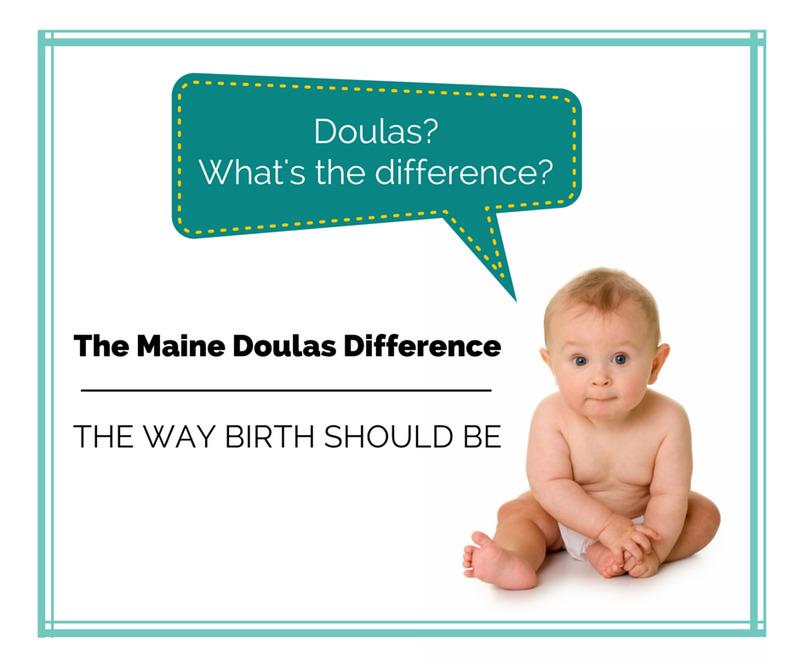 Maine Doulas does doula a little differently. Through our organization, in birth support, you have a two doula team on call for you from the moment you sign a contract. You will feel connected to your team, like they're part of the family. You won't ever have to wonder about a mysterious "back-up". With our postpartum care, you will also have an expertly trained doula on call for you. She will be ready to meet your family when you bring your baby home, or whenever you need extra support. Our doulas have short term, long term, daytime and overnight availability. Personalized, practical and compassionate care. Your family is worth it! Chances are we've worked with your OB or midwife. They know us by name or by face, and they have probably seen us in the delivery room. We find these relationships allow for a greater sense of cohesiveness with everyone present. Our experience enables us to build deeper connections with local practices, ensuring that communication is clear and supportive. Providers and nurses have often expressed relief at knowing that we're with you, because they know you'll have the attention you need to feel confident in your labor while they're busy with hospital tasks. We are often asked "what's your birth philosophy?". Quite simply, our philosophy is yours. We are always the number one supporter of Team You. You want a natural birth? We support that. You want to circumcise your son? We've got your back. You want an epidural when you arrive at the hospital? We're on board. You want a VBAC? We've seen quite a few. As long as you have all the information you need around any aspect of birth or parenting, our sole mission is to make you feel completely embraced in your decisions. We understand that any choice a parent makes comes from a place of love and an eagerness to do the very best to ensure a happy, healthy future for their baby. These are just a few ways that Maine Doulas is leading the way for doula care in Maine. We invite you to give us a call. We can't say what difference you'll personally find; we can only be sure that you'll see it clearly. This blog was written as part of the World Doula Week blog challenge. 3 Things: what are you thankful for? I had to sit for a few minutes to remember my first Thanksgiving as a new parent. Once I did, oh boy, the memories really flooded me. I have always longed for the formal gathering of extended family; the long table decorated with an overflowing cornucopia, sparkling cider in champagne flutes, steaming platters and bowls being passed between distant cousins. Our family holidays are usually more scarcely attended but not any less warm and loving. My son was born in the beginning of November 2011. The birth wasn't what we were anticipating (is it ever?) and we ended up with a longer than expected hospital stay. The afternoon we returned home with our five day old baby, my partner had to return to work in another state for two weeks. So having him home for Thanksgiving made the occasion seem more special. We were many things in those first few months; tired, full of joy, scared of doing it all wrong, starry-eyed, and thankful - completely thankful for this little baby. As I look back on the two of us, still learning about our new son, and ourselves as completely transformed humans, I am sending a little note of "thanks". It has come and gone and come again over these past few years, but the laughter over burnt lobster stuffing and adventures in infant potty learning have certainly made it more interesting. There was a lot of advice given and many stories shared. Thank you for always searching for your own path and learning what worked for you as a family. Your children are stronger and brighter for it. It was out of your comfort zone, but you took that newborn class when your son was two months old. You met others who were in the storm with you. They helped you see the calmer waters on the other side. You pulled each other into the life boat and sailed on. You formed a community; mothers, fathers and friends. Wishing all you Maine families a warm and joyful Thanksgiving! If you haven't heard the news: There's a new royal on the scene; Princess Charlotte. The Duchess of Cambridge, Catherine Windsor, emerged from the Lindo wing at St Mary's hospital just ten hours after giving birth looking, well, royal. When I saw the footage of her descending the stairs with her husband and brand new daughter my first thought wasn't "Oh that poor girl in her Jenny Packham dress and Jimmy Choo heels". I saw a proud, confident mother who was absolutely shining in the way only a new mother can. She was introducing her baby to the entire world. Did you see her beaming? She was showing the world that birth can be beautiful. In her way, she was telling every pregnant woman her positive birth story and sending a ripple of change across the pond. 2. ASSEMBLE YOUR ENTOURAGE - You can bet your silver spoon Kate wasn't in that room doing her own make up just a few hours after giving birth. She had a group of trusted people pampering the hell out of her. As you begin writing your birth plan, give some thought to the fourth trimester. Think about writing a postpartum plan, including a list of people who can make you shine as a mum; whether that's coming to the hospital to wash your hair and put on make up, or preparing meals in your house, or taking the princely big brother for a walk so you can nap. Doulas are expertly trained to meet all these needs and take care of everything else you haven't thought of. 4. PREPARE FOR THE BIRTH YOU WANT - Both Princess Diana and the Queen herself are rumoured to have used a method of hypnobirthing to prepare for birth. In royal tradition, Kate also used hypnobirth techniques in anticipation of her births. This type of childbirth preparation can help bring relaxation, calm and confidence, as well as decreasing painful sensations. Sounds good enough for a queen! There are many ways to ready your body and mind for labour, so research and find the philosophy that resonates most with you. 5. STAY IN YOUR PALACE - Keep the oxytocin flowing and stay in your home as long as you're comfortable. Kate laboured at home before going into the hospital, where she was admitted just two hours before the princess's birth. Staying in your home allows you comfort in familiarity and to be more flexible in how you labour; including eating and drinking, position changes, having a bath or shower, or walking outside. It will also mean you have more privacy and are disturbed less, which can help to establish active labour. 6. MOVE TO THE UK - Seriously though, there are certainly imperfections in any government healthcare system; but the NHS encourages that, when mum and baby are doing well, the best place for rest and recovery is in the home. The UK also encourages parents to take paid leave from work (get with it, US!). Midwives offer care both in hospital and then postpartum to ensure you are getting any help and encouragement you need settling in with your new baby. Kate was out of the hospital less than ten hours after giving birth to Princess Charlotte. 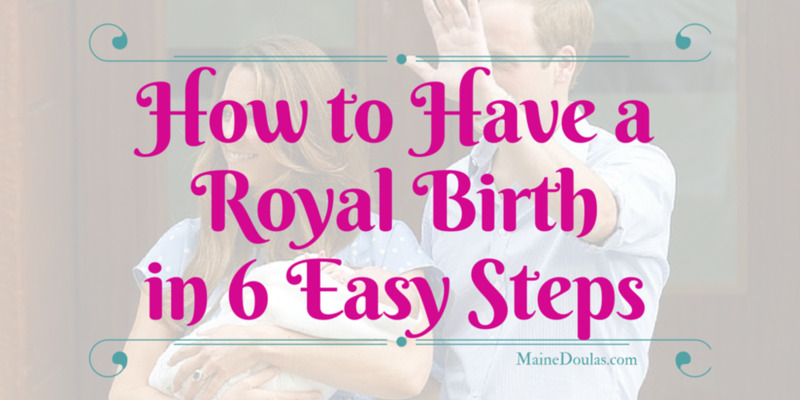 What else would you add to this royal recipe for a great birth?